UPDATE - JULY 2012: A planning application has now been submitted to turn these presmises in Green Lane into a mosque. Full details can be found here. 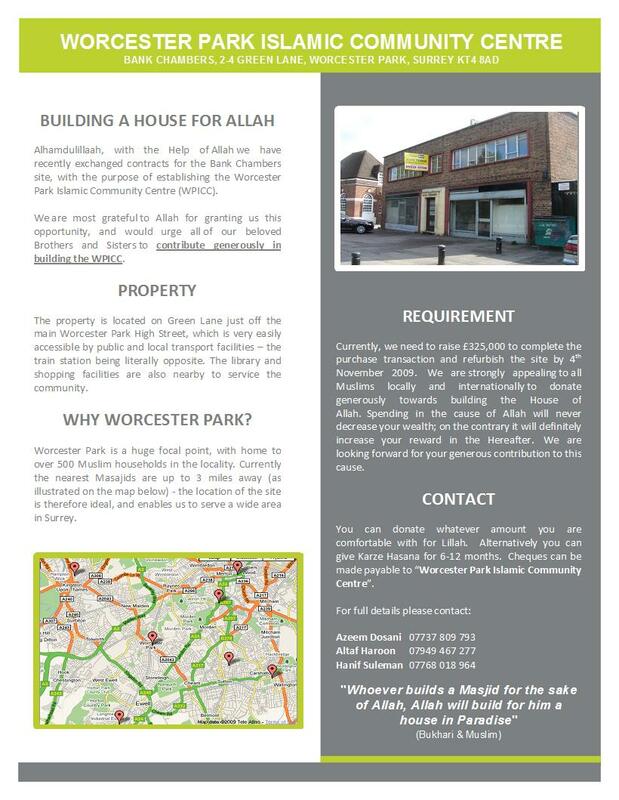 The group behind a proposed 'Worcester Park Islamic Community Centre' has denied suggestions on its website that it is planning to convert vacant premises in Green Lane into a mosque. A representative of the Centre confirmed to me that contracts had been exchanged on the 'Bank Chambers' building (next to Kingfish) but said that whilst plans had not been finalised, they would most likely involve the creation of an Islamic-funded community centre for the whole of the local community to use. When asked about suggestions on the group's website that the building was to be converted for use as a mosque, he told me was unaware of the existence of the website, which was taken offline within hours of our conversation. The website called for 'Muslims locally and internationally to donate generously towards building the House of Allah' in Worcester Park. 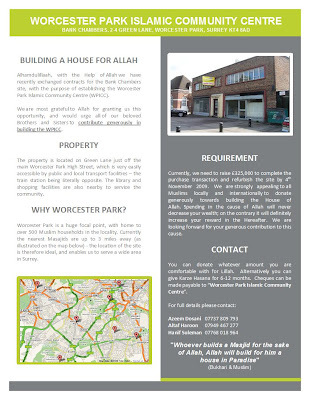 It described Worcester Park as 'a huge focal point, with home to over 500 Muslim households in the locality' adding that 'currently the nearest Masajids [mosques] are up to 3 miles away...' and included a downloadable pledge form for donors to help fund the £325,000 cost of creating of the Centre. No planning application has yet been submitted for the site. UPDATE: Two weeks after I broke this story, it was picked up by the Surrey Comet who ran a somewhat sanitised version of the story in their paper and on their website. The Google cache of the wpicc.org website has now gone - click on the image below to see a snapshot of the page.